In her debut novel, Helene Wecker tells an amazingly interwoven, beautiful mythological story. After reading it, I will happily read anything else she ever writes for the rest of her career. The story is a combination of historical fiction and fantasy literature and is masterfully layered with beautiful settings, deep cultural ties, powerful themes of love, hope, loss, and freedom, and unforgettable characters. The story begins in turn-of-the-century Poland when a man named Otto Rotfeld pays a mysterious man to make him a golem (a creature who has to obey their master) in the form of a woman he can take as his wife. On his transatlantic crossing to New York, Rotfeld wakes the golem but he soon afterward dies from a burst appendix. Alone, newly awakened, and without her master, the golem (who was given the name of Chava, meaning "life") is without direction. Her ability to hear the thoughts and desires of all of those around her leaves her mind in a deafening roar of confusion. When passengers on the boat realize Chava's name was never on the passenger list (her clay body had been stored in a wooden box until Rotfeld awoke her), they threaten to turn her into the police. As they near the dock in New York Harbor, she escapes under the shadow of the Statue of Liberty by jumping off the boat and walking across the depths of the ocean until she reaches the shore (she needs neither air nor food to survive). 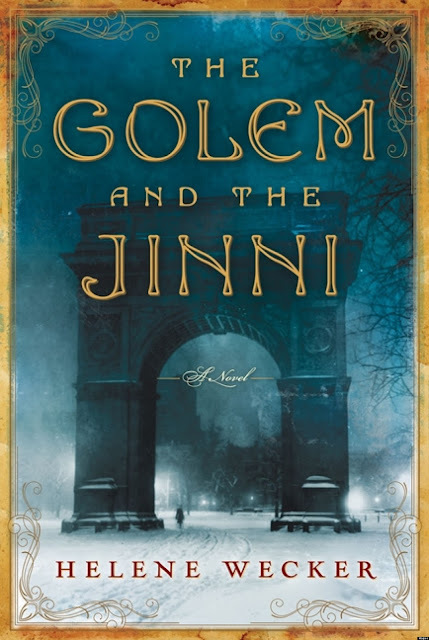 When an elderly rabbi, Avram Meyer, sees the woman wandering the streets and recognizes her as a golem, he takes her under his protection, trying to pass her off as a seamstress and a baker while they try to figure out what to do. At the same time, a parallel story includes the day Boutrous Arbeely (a Syrian tinsmith living in Manhattan) repairs an old flask and releases a jinni (or "genie"). The jinni, Ahmad, had been trapped for one thousand years by a man who captured him and bound him in human form. Ahmad cannot remember how he was captured but can clearly recall his life in the Syrian desert, dwelling in a glass castle and roaming free and unchallenged. Arbeely takes on Ahmad as an apprentice--the jinni is able to melt metals with the heat of his hands--while Ahmad struggles with his new body, his physical appetites, and his anger. Wecker's ability to weave in and out of narratives, characters, and time as she tells numerous stories is engaging, compelling, and a true page-turner. The book reminded me of Mary Shelley's Frankenstein--one of the highest compliments I can pay a text--because of its ability to complicate readers' emotional responses to creation, loss, suffering, growth, hope, independence, and relationships. The ending was absolutely perfect and the craft of the writing itself is outstanding.